by Gráinne de Búrca and J.H.H. Weiler (eds.). Cambridge: Cambridge University Press, 2012. 354pp. Hardback $110.00. ISBN 9780521177757 Paperback $40.00. ISBN 9780521192859. The overlapped interconnectedness of global (supra-, inter-, transnational) social, economic, and legal interactions, and the ensuing dissolution (“fragmentation”) of the inherited frameworks of reference, pose a challenge to the constitutional state, insofar as the conceptual vocabulary of nation-state constitutionalism and the legal tools of constitutional law increasingly fail to master their facts. The European Union (EU) is arguably the best case in point to illustrate these general developments. The EU is the most advanced form of transnational cooperation and its continued, if somewhat syncopated, progression towards wider reach (expansion of the Union, now comprising 27 Member States) and deeper integration (an expansion of competences far beyond the initial purview of a common market) create legitimacy rifts in the architecture of the Union and tensions between the Union and the constitutional orders of its Member States. To wit, even though the terms are widely used and the topic as such has secured a comfortable place in academic curricula, the concepts of EU “constitutionalism,” “constitutionalization,” “constitutional law,” are contested, tentative, and opaque. 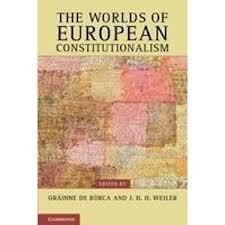 The Worlds of European Constitutionalism, a collection of five essays by prominent EU and international public law scholars, is an exploration of the general problematics of constitutionalism beyond the national state. The arguments regarding the relevance of newer conceptual vocabularies (“global constitutionalism”, “international constitutional law”, “constitutional pluralism”) are framed by the authors within the context and revolve around the vagaries of the EU constitutionalization process. The volume closes, innovatively and very interestingly, with a chapter-length “Dialogical Epilogue” in which one of the co-editors, J.H.H. Weiler, engages in conversations with his colleagues and challenges, in turn, their assumptions. The first chapter, by Bruno de Witte, is a rigorous and sobering assessment of the Union as an advanced international organization. De Witte’s careful analysis of the legal history of the EU, the prevalent positions in legal doctrine, and the landmark decisions of the European Court of Justice (ECJ), shows that, its innovative features (e.g., supremacy, direct effect) notwithstanding, the EU still functions within the logic of international public law. The states continue to be (and, as the author compellingly argues, certainly continue to perceive themselves as) the “Masters of the Treaties” (p.36). The occasional constitutional hyperbole in ECJ decisions, exalted initiatives such as the defunct 2004 Constitutional Treaty, and [*491] the occasional use of the term “supranational” in treaties are dismissed as exceptional, stylistic, and non-essential. De Witte concedes that the Union evinces certain characteristics that distinguish it from other international organizations and in that respect the project verges on an embryonic form of federalism. Nonetheless, he argues that novel and hybrid conceptual descriptions, such as “federation of states” still denote this in-between nature of the Union much better than the “federal state” label: “Alternative terminology should, in order to be attractive and true to reality, encapsulate both the international legal nature of the EU and its uniquely massive pooling of Member State powers and constitutional mode of operation” (p.51). In the closing debate, Joseph Weiler asks whether all those incremental additions have not already turned the Union into a qualitatively different species, so that the international public law language would now fail to describe correctly the realities (much as, as Weiler wryly points out, it would not make sense to call humans “advanced” or “experimental” apes simply because we have evolved from the latter (pp.266-267)). The jury is, however, always and endlessly out on the continuum-related paradoxes. The next two arguments are built around a relatively recent development, the two decisions of the Court of First Instance (CFI, now General Court) and the ECJ, respectively, in the Kadi case. Of essence in the decisions are the radically different conceptual standpoints of the two courts towards international law. The litigation arose in the context of EU regulations implementing an EU Common Position, which in turn implemented United Nations Security Council Resolutions adopted under Chapter VII of the UN Charter and concerning the suppression of terrorism. The plaintiff, Yassin Abdullah Kadi, was blacklisted by the Sanctions Committee of the Security Council as a person suspected of supporting terrorism. His assets had been frozen in Europe in fulfillment of the UN mandate. Reviewing the lawfulness of the implementing regulations, the CFI ruled that international obligations in pursuance of the UN Charter prevailed over EU law. But, somewhat surprisingly, the court deemed itself mandated to censor the conformity of Security Council Resolutions with jus cogens norms. Thus, for the court of first instance, the international legal order was organized hierarchically and the EU legal system was subordinated to the “constitution of international law.” On appeal, the ECJ reversed, insisting upon the autonomy of the EU system, and ruled that the conformity of the implementing measures ought to be reviewed in accordance with EU law: “[T]he obligations imposed by an international agreement cannot have the effect of prejudicing the constitutional principles of the EC Treaty” (para 285). The impugned Council regulation was annulled because it infringed European fundamental rights guarantees. The third chapter by Gráinne de Búrca, proffers a “soft constitutionalist” solution to this dilemma, in between the ‘monist’ position of the CFI (which resonated, says the author, with constitutionalist theoretical approaches towards the international legal order) and the segregated, ‘dualist’ stance of the ECJ (closer in its approach to pluralist theories). De Búrca’s soft constitutional alternative – “to strong constitutional approaches and to strong pluralist approaches alike” is professedly Kantian in inspiration, drawing its strength from the assumption of an international community of sorts, the familiarly Kantian emphasis on universalizability, and “the emphasis on common principles of communication for addressing conflict” (p.136). De Búrca exemplifies her position with the Solange decisions of the German Federal Constitutional Court (the word means “so long as”), in which the German court addressed the (then) European Community with a measure of reservation but also empathy and openness. The GFCC ruled that so long as the EC system would not provide a threshold of human rights protection similar to that guaranteed under the Basic Law, the Court would continue to review EC legal acts. There is much optimism in De Búrca’s proposition. Arguably, this Kantian-Habermasian exercise in judicial comity may work in the best of times and in a relatively homogenous judicial-legal-constitutional milieu, such as that in which both the ECJ and the German Constitutional Tribunal dwell. How this conversational exchange would operate at the less amicable international level, especially as the Security Council is neither a court nor – strong chances are – will wish to [*493] be routinely overseen by one, is more of a riddle. The next chapter, by Daniel Halberstam, seeks to bridge to CFI/ECJ gap by resorting to “plural constitutionalism”. The conceptual language of plural constitutionalism is allegedly composed of “[s]imply and boldly put, voice, rights, and expertise,” since this “kind of grammar of legitimacy” would be common to the “competing authors as they make their respective claims of authority” (p.172). Halberstam points to the position of then Advocate General Maduro in Kadi as an example of “plural constitutionalism” avant la lettre. The argument as such flows coherently. One wonders however whether Halberstam’s preferred version of global constitutional Esperanto is not too abstract and vague (to wit, “voice” seems to be a very poor substitute for popular sovereignty and nation-state democracy) to be of very high epistemological or normative use in constitutional terms. Weiler makes a similar retort in the closing dialogue. In the last chapter, Nico Krisch undertakes “The Case For Pluralism In Postnational Law.” Krisch, glossing on Tully’s Strange Multiplicity, makes a convincing critique of classical constitutionalism, arguing that the element of hierarchy and the leveling bias in constitutionalism do violence to diversity in the nation state, are faced with a serious and more intractable task in divided societies, and that such innate deficiencies are multiplied exponentially in a postnational context. Krisch seeks to offer a normative vision of pluralism, connected with the idea(l) of public autonomy, a tame pluralism as it were, in which not all polities “deserve respect”: “Which polities deserve respect and tolerance will then depend, again, on the degree to which they are based on practices of public autonomy: on social practices that concretize the ideal of self-legislation” (p.252). He does not fully make good on the initial promise. Although the core idea as such is interesting, it is hard, on the terms of this chapter, to understand what the author means precisely by those worthy phrases. Unlike the other contributions, his piece offers scant guidance in terms of concrete examples and not that much more by way of disciplined analysis. The reader is occasionally showered with a somewhat tiring blizzard of referential cues ranging from Habermas and Kant to Schmitt and Tully and Koskenniemi and Rajagopal (‘Thus David Held regards … and Jeremy Waldron sees … and John Rawls, responding to Habermas’s charge that [etc. ]” (excerpt from the first paragraph at p.243)). The Worlds of European Constitutionalism is an interesting book, which one can read with intellectual pleasure and profit. It will occupy a fine place in its genre. If one were to raise a (minor) objection, that would be directed at the genre itself, more specifically at the prevalent tone in EU “constitutionalist” literature, of which most contributions partake: somewhat complacent. One finds that whatever malfunctions in the EU can be addressed by more Europe (and more internationalism), more pluralism, and more dialogical constitutionalism. A few nods to Kantian universality principles and to the Habermasian communicative theory are always de rigueur. And, of course, a return, to be sure partial and qualified, to nation state constitutionalism is anathema, even as a hypothesis. Hierarchy, nation-state, and [*494] monism are bad words (perish the concepts and may their names be cursed). One should not question the tenets of the faith. The Union has been in the middle of an extremely severe crisis (related to the common currency and sovereign debt) for some time now and an end to it is nowhere in sight. There are serious constitutive tensions at the very core of the project, which aggravate rather than solve constitutional conflicts, both in the Union and in the Member States. The positions of domestic constitutional courts have ceased to be as affable as in the yonder times of Solange (witness the rather chilly 2009 Lisbon Decision of the German Constitutional Court). In a newer EU jurisdiction, such as my own, the post-accession monitoring of constitutionally-relevant criteria (anti-corruption reforms, judicial independence) by the Commission has been very far from successful, by its own admission in the biannual Monitoring and Cooperation Mechanism Country Reports. Moreover, recent interventions by the Commission in domestic Romanian politics, during a presidential impeachment procedure this summer, have created a relatively widespread impression of partisanship or incompetence rather than principled defense of constitutionalism. The book does not give enough sense of the stringent, very actual reality that the world or house of European constitutionalism is currently on fire. Constitutional fault lines, going to the core of what The Worlds of European Constitutionalism look like, will decide what the future will have in store for us (both in terms of the internal functioning of the project and with respect to how, if at all, it can project itself convincingly in the international arena). These problems cannot be fully wished away by sheltered cruise sailings into the sunset of EU constitutionalism. T 315/01 Kadi v. Council and Commission . Cases C-402/05P and C-415/05P, Kadi and Al Barakaat v. Commission and Council, judgment of the Court (Grand Chamber)  ECR I-6351. Copyright by the Author, Bogdan Iancu.